The discovery of 71 pieces of red ochre in the oldest section of a burial cave in Israel has prompted researchers to suggest that the symbolic thinking that marked the beginning of modern-day human thought arose deep in the Stone Age. The received wisdom has been that the assignment of symbolic meaning to specific items and colours emerged no earlier than 50,000 years ago. But the association of red ochre with skeletons found in the oldest section of the Qafzeh Cave has been taken to indicate that symbolic burial rites were being performed more than 90,000 years ago. The controversial theory that modern thought did not emerge with the appearance of Upper Paleolithic cultures has been put forward by Erella Hovers of the Hebrew University of Jerusalem, who directed the Qafzeh project. She argues that in the Middle East and Eurasia "many symbolic behaviours that are considered modern existed for a time [before the Upper Paleolithic] and then disappeared, to be reinvented time and again". The 'continual reinvention' proposal stems from the fact that similar ochre use does not appear again in the Qafzeh Cave until 12,700 years ago. Red ochre is a form of iron oxide which yields a pigment when heated. The precise meaning of the use of ochre is unknown, but it was widely used in primitive societies and even today the colour red is used in non-industrial cultures as a symbol of fertility or vitality. The ochre at Qafzeh was brought to the cave from nearby sources. Large hearths and ochre-stained tools in the same sediment levels that contain the oldest human remains show that the ochre was worked on-site. Hovers and her co-workers say that the pigment was used with the shells of inedible molluscs found in the cave, possibly in symbolic activities related to burying the dead. Prehistoric symbolic expressions most commonly occurred in large populations that stayed for extended periods in resource-rich locations, says Hovers. But in the small nomadic groups typical of Stone Age Middle East symbolic behaviour would have surfaced for special activities at special sites, such as interment of the dead at Qafzeh Cave. A report published in the August-October Current Anthropology has had a mixed reception. 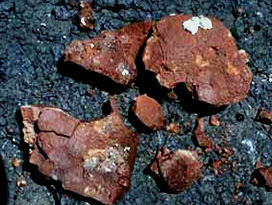 Sally McBrearty of the University of Connecticut believes that Qafzeh adds to the evidence of the great antiquity of the colour red as a symbolic category, pointing out that engraved ochre dates to 77,000 years ago in South Africa. On the other hand, Richard G. Klein of Stanford University holds that ochre use was merely a step towards advanced symbolic culture, which he places at around 50,000 years ago. NOTE: If you want to follow the Scarlet Thread, take a look a Julie's blog where she posts another exerpt from her book in progress. Using a technique called helioseismic holography, astronomers can do something amazing: look through the sun to find sunspots on the far side of our star. On Nov. 11th and 12th their holographic maps revealed giant sunspots 486 and 488--the same active regions that caused so much intense space weather a few weeks ago. The International ANSWER Coalition, has created the Community Action Project to Support Labor (CAPSL). This week CAPSL is initiating a mass community food drive in support of the striking and locked-out UFCW grocery workers fighting to protect their health benefits. FOOD DROP OFF CENTERS ARE NOW LOCATED IN TARZANA, KOREATOWN, SOUTH CENTRAL L.A., AND VENICE. NABUTAUTAU, Fiji (AP) - Villagers in a remote Fijian community staged an elaborate ceremony of apology Thursday for the relatives of a British missionary killed and eaten here 136 years ago. The Rev. Thomas Baker and eight Fijian followers were killed and devoured by cannibals in 1867 in the village of Nabutautau, high in the hills of the South Pacific island of Viti Levu. Residents say their community has been cursed ever since. In a mixture of ancient pagan and modern Christian rites, the villagers have staged a series of ceremonies hoping to erase the misfortunes they believe have kept them poor. The rituals - which started about a month ago - culminated Thursday with the offering of cows, specially woven mats and 30 carved sperm-whale teeth known as tabua to 10 Australian descendants of Baker. ``This is our third apology but, unlike the first two, this one is being offered physically to the family of Mr. Baker,'' Ratu Filimoni Nawawabalavu, the village's chief, told The Associated Press. Nawawabalavu is the great-grandson of the chief responsible for cooking the missionary in an earthen oven. Past apologies have not helped. In 1993, villagers presented the Methodist Church of Fiji with Baker's boots - which cannibals tried unsuccessfully to cook and eat. There are differing accounts of Baker's demise. A villager said last month the incident started when the chief borrowed Baker's hat. Baker tried to take it back without knowing that touching a chief's head was taboo and punishable by death. Others say the missionary lent the chief a comb, then touched his head as he tried to retrieve it from the chief's tight, curly hair. Villagers believe that since 1867, either Baker's spirit or disapproving gods have made sure that modern developments like electricity, a school, piped water supply and other essentials enjoyed by most Fijian villagers have been kept from them. It was only two weeks ago that a logging company cut a track to the village. Prime Minister Laisenia Qarase, who flew into the village by helicopter for the ceremony, is leading a campaign to improve life in isolated areas. Fiji, a nation of 320 islands, is about 2,250 miles northeast of Sydney, Australia. Early female-dominated societies lost their power to men as they acquired cattle, a new study demonstrates. The idea that early communities became "patrilineal", with male status and inheritance being most important, when they gained cattle has been debated since the beginning of modern anthropological studies in the nineteenth century. However, no one had been able to convincingly demonstrate a causal link. Now Clare Janaki Holden and Ruth Mace at University College London, UK, believe they have produced some of the firmest evidence yet to back the theory. They made a linguistic tree of the evolution of 68 African Bantu languages, which include modern day Swahili and Zulu, and correlated this with the acquisition of cattle herds by those language speakers and the type of society they lived in. The researchers then used a clever mathematical model to infer what had happened in the past to produce the pattern of languages seen today. "At an early stage these populations were more matrilineal than today," Holden told New Scientist. "They then adopted cattle and became patrilineal." "I think this study is very important," says Mark Pagel, an evolutionary biologist at the University of Reading, UK. "What they are trying to show is that human mating patterns, wealth inheritance and dominance systems respond to ecological variation in the same way that we would expect animal populations to behave." Holden believes reason the acquisition of cattle led to a switch to male-dominated societies is most probably linked to the system of "bridewealth". This tradition, in which a bridegroom gives cattle to a bride's family, is particular to the Bantu speaking regions of sub-equatorial Africa. "If a man's got lots of cattle he can have lots of wives. So if you have cattle it makes sense to give it to sons rather than the daughters," she says. The fundamental reason for this is that wealthy, and therefore attractive, sons are likely to have more children than daughters, because while women must bear each child a man need only impregnate a woman. Holden believes that the acquisition of wealth may generally causing a shift in power to men: "If you have valuable resources they are probably going to become monopolised by men because men can use them to acquire more wives or women." Another factor that could be important, Holden says, is cattle raiding, with men better able to defend against marauders. The Bantu linguistic tree created by Holden and Mace charts the divergence of the languages from a common starting point about 3000 years ago. They then added data about each population's ownership of cattle and their type of society, matrilineal or patrilineal. The pair then applied the mathematical model, developed by Pagel, to find the "maximum likelihood" historical scenario that would have produced the modern day situation. They found that acquiring cattle did indeed cause a shift to a man's world, or one of "mixed descent" where both sexes are important for inheritance. Crucially, they were able to account for the fact that the cultures were related. Cultural traits tend to be passed down generations in the same way as genetic ones. Pagel, who is also Mace's husband, says the study shows the cultural phenomenon arose independently a number of times and "greatly strengthens" the belief that the cattle ownership and patrilineal societies have a causal connection and are not observed together for some other reason.